I generally avoid reviewing "family cookbooks" because they tend to focus on food for children. Not that there's anything wrong with that, but I don't happen to have any. Happily several new cookbooks also expand the notion of family and as a result serve a much broader audience. After all, our family should include all the people we care deeply about, not just those related to us by blood. Whenever I'm in London I end up eating at Leon. In a city with frightfully expensive food, Leon serves what they call "naturally fast food." It's healthy, quick and inspired by flavors from all around the world. 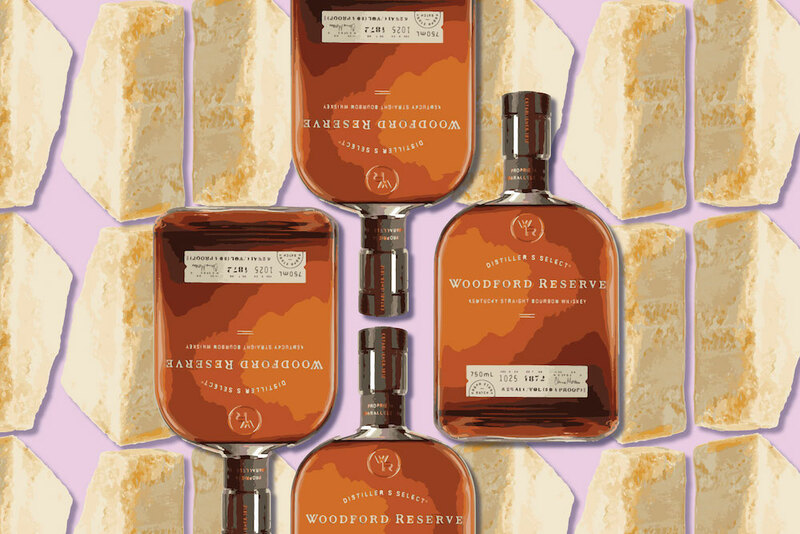 They source ingredients responsibly and so it's food that makes you feel good and that you can feel good about. Truly a winning formula. 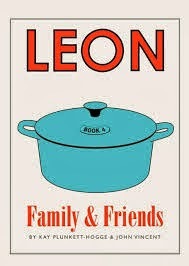 The latest book from Leon (there are two others) is Leon Family & Friends. The book has lots of basic kinds of recipes for things like roast chicken and hummus but also amazing stuff like Anna Hansen's Pumpkin & MIso Cheesecake. There are also some Thai recipes and cool stuff like six ideas for "things on toast" hot chocolate five ways, four risottos and three different versions of salmon cooked in parchment. The recipes are generally easy and appealing and suit kids as well as adults. Bravo! It's a particularly great book for anyone just starting out on their own with or without kids. It's a keeper. 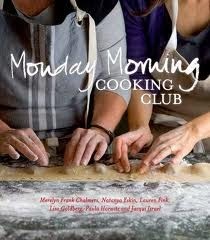 The Monday Morning Cooking Club book is really my kind of book. It's written by a group of Jewish women a "sisterhood" in Sydney Australia. Their recipes are so homey and comforting. There are tinges of Eastern Europe but also intriguing Indian, Moroccan and Persian recipes too. I want in on this group that cooks and shares Israeli Couscous Soup (inspired by a recipe my dear friend Marlena Spieler), Peach Mascarpone and Raspberry Trifle, Beetroot and Chickpea Salad, Quinoa Tabbouleh, and Viennese Apricot or Plum Dumplings. Australia like the US is a country of immigrants and the book tells their stories. The only potential down side to the book is that some of the recipes use grams as a measurement, not a problem if you have a scale however. It's a keeper. 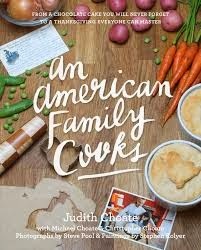 An American Family Cooks is written by James Beard Award winner Judith Choate and her family; it's the recipes her extended family cooks. "Fancy, some not-so-fancy, and some just plain everyday" is how she describes the 100 recipes. These are very solid recipes by a family of foodies. I mean, who else starts Thanksgiving with fried eggs showered in $500 worth of white truffles? The notes with each recipe are really instructive explaining lots of details about techniques or ingredients. There's lots of Americana here, but also some Mediterranean style recipes too, things like Paella, Mom's Potato Gnocchi and Pate de Campagne to go along with Nana's Chicken Pot Pie, Boston Brown Bread and Dungeness Crab as well as Soft-Shell Crab. It's a good book, but not exactly ground breaking. Keeper? Depends on your cookbook collection. 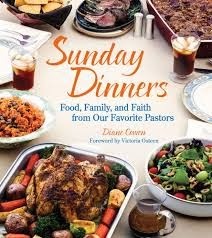 Sunday Dinners: Food, Family, and Faith from our Favorite Pastors is also a compilation of recipes, but from pastors some of whom rely on butter-flavored vegetable shortening, Velveeta and canned pie filling and others who don't. While there are three appealing Vietnamese dishes and lots of American favorites like Scalloped Potatoes and Sunday Pot Roast, many of the recipes like Slow Cooker Macaroni and Cheese and Strawberry Cake made with a cake mix, strawberry gelatin and frozen berries are frankly not my style. If you know someone who would be inspired by wonderfully written stories of pastors and how food plays a role in their life and their family, this might be a nice book for them.